Stay warm when it's cold outside (or inside!) 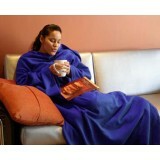 with this versatile blanket, available in a variety of colors to tickle your fancy. Whether you're at the big game, gathered around a campfire with friends, or just relaxing in the comfort of your own home, the possibilities are endless! 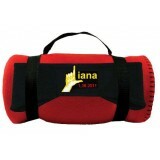 You personalize it with anything you choose such as a fun message or your name and date. 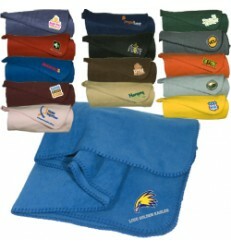 Made from fuzzy fleece, just place in your bag and you're ready to go. Measures 50"w x 60"h when opened. Wondering what your personalized applique will look like? No problem! 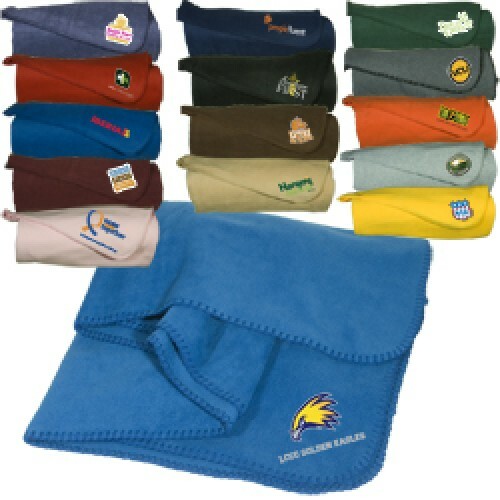 You'll have the chance to approve your design before we embroider your favor. This product has a minimum quantity of 24.